No, the mystery's not why we're moving to Warminster, Wiltshire, in a week's time but a 'remarkable series of UFO sightings in 1965'. "Warminster, a small Wiltshire town, was the focus for a remarkable series of UFO sightings in 1965. Hundreds of local people, and UFO investigators who visited the area in the years which followed, have observed and studied these astonishing phemomena. The Warminster Mystery is a dramatic unfolding of these sightings, with eye witness accounts of strange 'things' seen by day and night; of bewildering mushrooms of smoke, crescents of fire, weird and disturbing sounds, and even accounts of conversations with those from Outer Space. 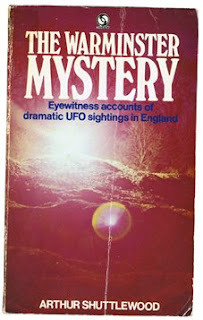 The illustrations in this book include several fully authenticated photographs of UFOs, taken in front of witnesses." As well as UFOs the surrounding area is full of mysterious, unexplained and strange stuff such as crop circles, ley lines, burial mounds, chalk white horses on hillsides (eight of them in Wiltshire) and Silbury Hill, Europe's largest man-made hill. Since reading about the UK's £65m in lost one pence pieces, I have decided to revise my earlier rule of only picking up five pence pieces and above. I am now on the hunt for coppers too. This could be a get rich slow solution. This is a potential copper mine. 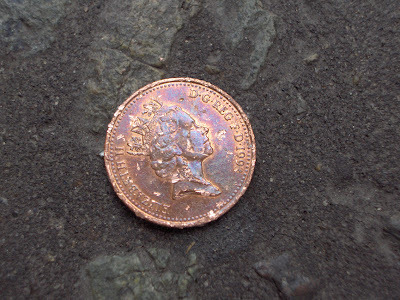 The streets – literally – are paved with pennies. If any readers spot any – on the pavement, behind the sofa, in the pub, anywhere – please email me the address (London only I'm afraid for the time being) and I will endeavour to come and pick them up.